After getting sidetracked for hours while writing this post because Rho decided to watch the live-stream of DOTA2 next to me - how freaking distracting - here's ep06 of this anime finally. 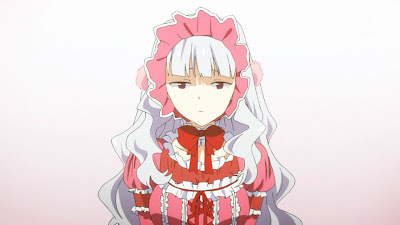 Takane! What have they done to you?! This episode continued with the official debut of Ryuuguu Komachi, but I don't think that's the person/people that the episode actually focused on. 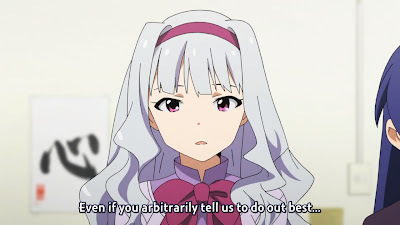 If I really think about it, the episode was probably mostly focused on Producer, with the other idols (especially the girls "left out") providing plot points. Sadly, this episode revealed just how much of a failure at his job this man is. I don't hesitate to be this mean at all; he's shown time and time again that, whether or not he's really taking this seriously, he's just not doing a good job. 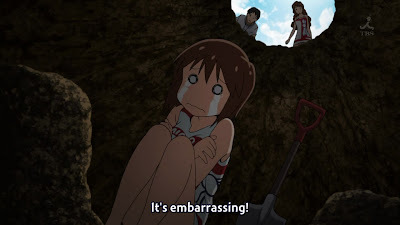 The episode ended on a high note, that perhaps Producer had learned from his mistakes - but, honestly speaking, I had thought that the previous episodes were mistakes for him to learn from already. You need more idols to fit in that large building. Then you're just not good enough. While the interview was going on, the other idols and Producer were eagerly watching. Haruka became very distraught, since her last name also contained a reference to "water" (just like Ami, actually), and yet she hadn't been chosen to be in the group. Of course, I would have expected that Mami would have been more distraught, considering she even looked like one of the members and wasn't chosen, but there was no mention of that... Some of the other girls (Yayoi, Makoto and Hibiki, in specific) seemed pretty unaffected, commenting instead on how they hadn't known that the reporter was actually a reporter, thinking that he was a drinking buddy of the president's. Producer seemed to be the one most affected, having been outdone by his "junior". Of course, he never really came out and clearly said it, but it was pretty clear that the theme of jealousy was prevalent throughout the episode. But that's what pep talks are, random "ganbatte" cries. In keeping with his fumbling and bumbling self, Producer became very edgy when he saw just how packed the group's schedule was, and how he had nothing significant lined up for the other girls. 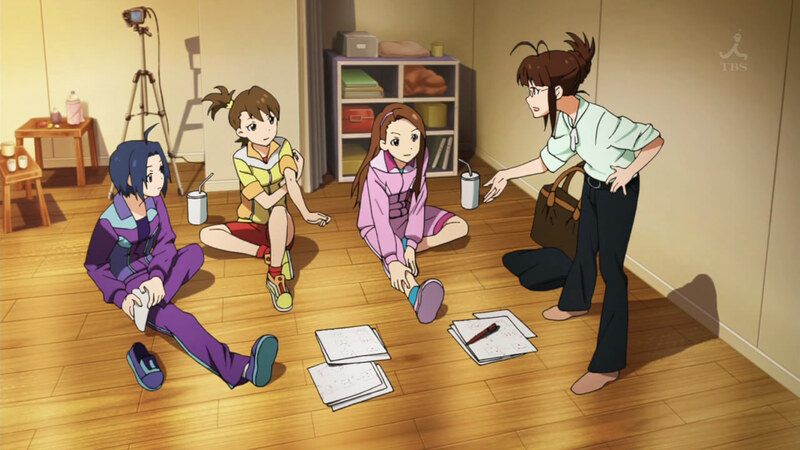 I find it a little weird that Ritsuko would be in charge of three girls while Producer got the rest; it seems a little unbalanced. 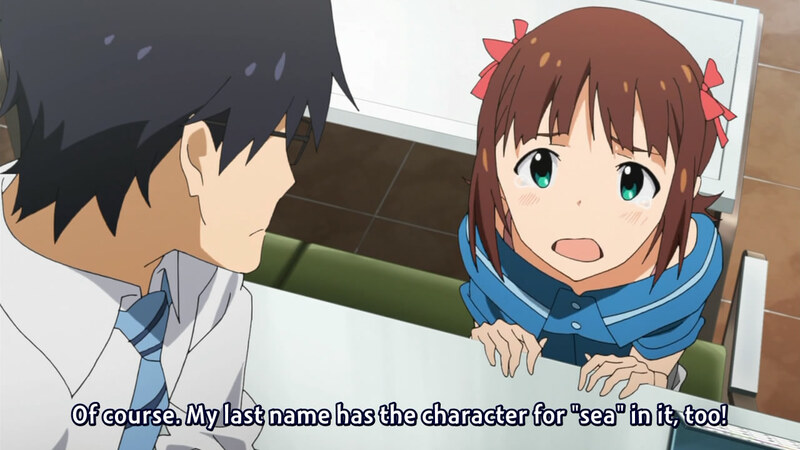 However, I guess it's because she's a junior while Producer is (somehow) a full-fledged producer. His uneasiness culminated in a pep talk to the girls that didn't really make much sense, since he was telling them to just be better. Nice going. The girls didn't chastise him at all, however; instead, they supported him and realized that he was nervous. It's sad how he hasn't been doing so well in such a nurturing environment; would he do better if his surroundings were harsh and toxic, pushing him into action? Producer kicked it into high-gear after his "failed" pep talk with the girls, attempting to promote them more than ever. The montage of scenes basically showed how much he was failing, since he didn't seem to get anyone's attention no matter which girl he was pushing. 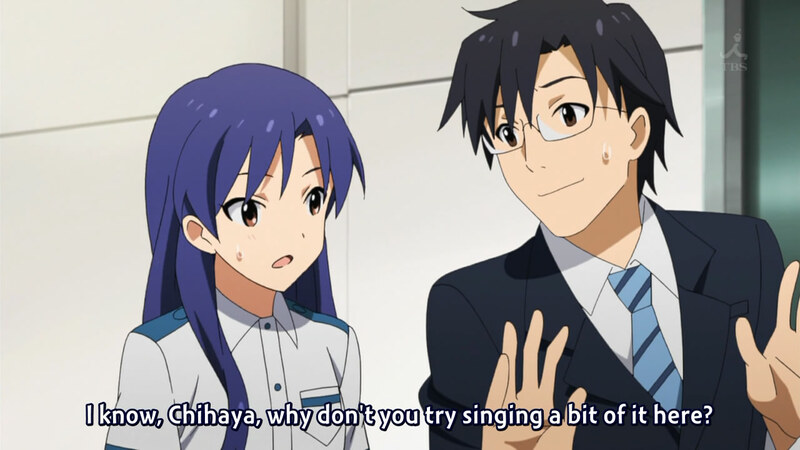 I really do have to comment on the strangeness that is Chihaya's character. She has said before that she wants to be a singer, not really an idol, and yet she didn't seem very willing to sing in the hallway quickly to the man that Producer gave her CD to. Being a singer means being able to display your voice anywhere, regardless of things like "instruments", "background music" or even "surroundings". I won't say that it's her fault for not being aware of what's going on around her and pushing to be a part of Ryuuguu Komachi; I'm sure Ritsuko made her decision properly (instead of actually haphazardly throwing girls with affiliations to water together). She has, however, shown a lack of confidence and a near-constant pout that will honestly continue to get in her way unless she learns to deal with it. I was happy when the episode showcasing her ended without a magical fix, but now I wonder if she's meant to be a crash-and-burn story instead of a motivational one. While all of this was happening, Ritsuko was busy with her girls, prepping and training them for their official debut on a popular music program. (If I were Chihaya, I would take note of that fact - as she seemed to do at the end of the episode - and learn something from it. Confidence is hard to get, but it still takes one step at a time.) 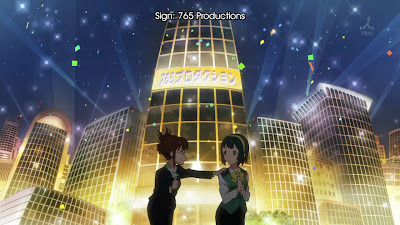 In stark contrast to Producer's efforts, I noted that Ritsuko didn't involve the girls in Ryuuguu Komachi in any way until the group had officially been green-lighted by 765 Productions. Conversely, Producer was taking the girls along with him, running at a pace not suited for those with much shorter legs than him, and so I wonder how Ritsuko did her role. Who did she talk to? How did she present the girls? It's really something to marvel at, her success. Ah, so it's not a hypothetical hole at all. 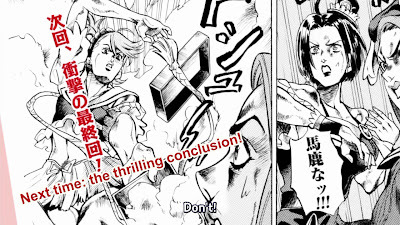 Sadly, all of Producer's efforts were wrong. That's pretty harsh terminology to be using, but that's what it was. If he's really such a veteran in this industry, I have no idea why he would be sending girls to jobs that had nothing to do with them. 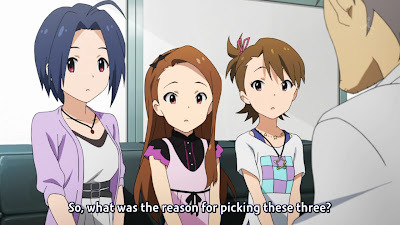 Takane being photographed in frilly clothing when Yayoi was better suited, Yayoi being sent to be a stunt-extra when Makoto or Hibiki would have jumped at the chance, Yukiho being sent for a "show girl" job when she's so conservative - his mistakes are pretty rudimentary. Wasn't the first episode all about him finding out more about the girls? He really failed at it. I wish I could be less harsh, but I was astonished at the mistakes he was making. How could he not know by now that it's better to promote already-existed strong points instead of attempting to create certain characteristics, much less throwing them into their weaknesses? If Yayoi is afraid of heights, then that's something to get over only if necessary (like Sho in Uta no Prince-sama, considering he wants to be an action hero), but it seemed far from necessary. I understand that this was the typical "lowest point" scene as done in story-telling, but it was hard to believe. How could you not know something so basic?! Miki: jail-bait, now with a purpose. Just as in other episodes, Producer's gaffe was fixed by one of his idols. He had essentially double-booked Hibiki, not even realizing it until the second place called to talk about how they were missing an idol. How embarrassing. Was that the point? 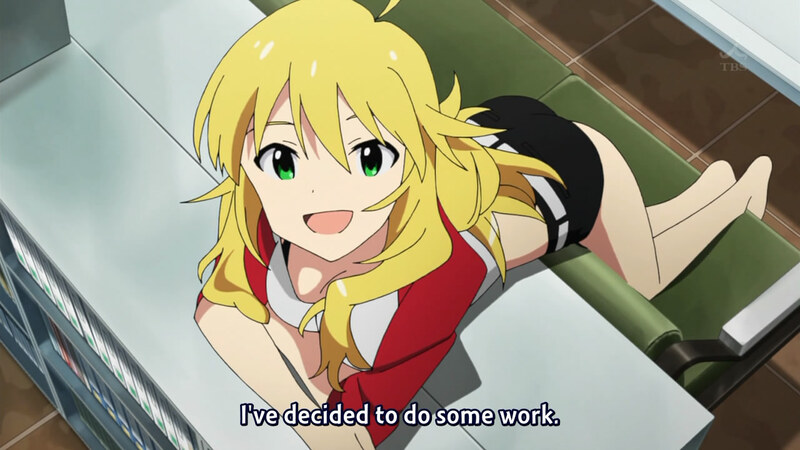 However, Miki came to the rescue. Kotori spoke to a harried Producer and suggested that they send a replacement idol, to which he agreed, and Miki eagerly volunteered. Earlier in the episode, she had seemed to be quite interested in Ryuuguu Komachi (even questioning why she hadn't been placed in it) and wanted to do something productive to get more jobs. The fact that she was being so proactive makes me like her more; previously, I had begun my impression of her on the wrong foot (assuming she was only the jail-bait character). 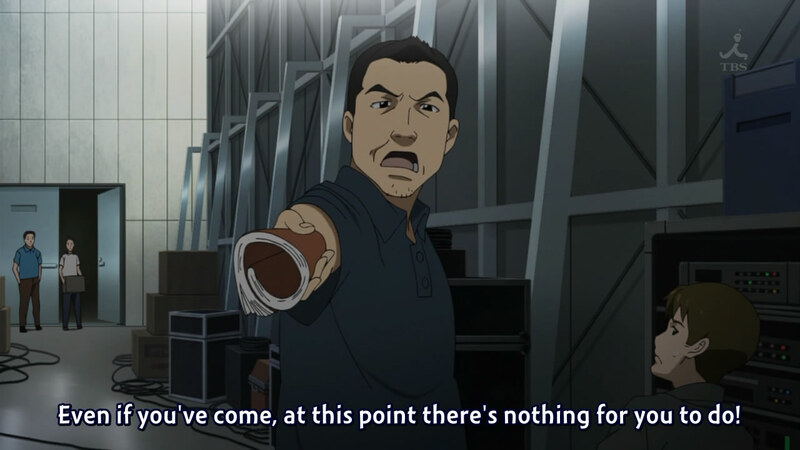 In the end, whether or not Producer gets them jobs, it's also in their role to push for it. "Damn straight! I decided to get fired already!" 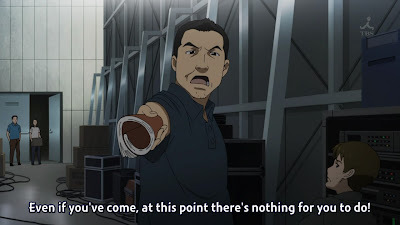 The "manager" (or whatever his role is) at the venue (where Miki was heading) seemed extremely stupid, stating that "nothing would happen" even if the second idol showed up. I don't understand what kind of logic that is; is it better to have no performance instead of a "bad" one? I can get behind that theory, but they're idols; is it too farfetched to assume that they would be good at would they do? It was a little too theatrical, setting up the "ooh factor" for what happened next (although it was pretty amazing, on its own). Miki turned out to be a kind of "prodigy", able to remember the dance moves after seeing it just once. 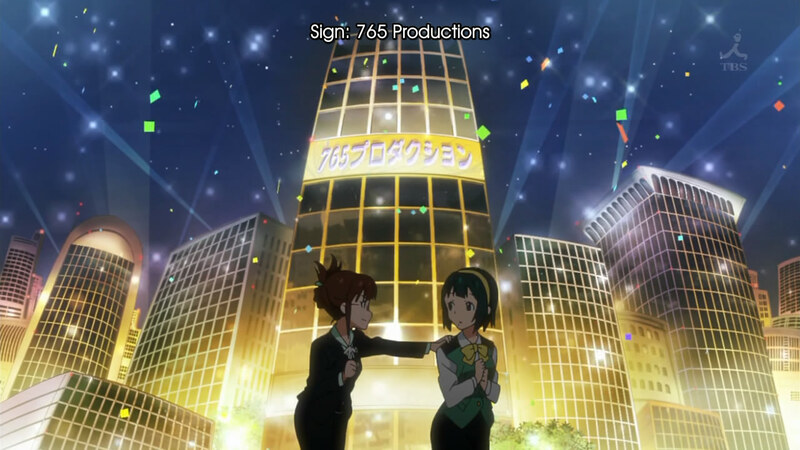 Meanwhile, Haruka and Hibiki urged Producer to go to the other venue, since he would probably be needed there more. After taking the entire day to get there (how useless), he ran in while apologizing (for his terrible idols, I guess? ), only to be congratulated since Miki did such an amazing job. Honestly, I hate people like Producer. What scum. He did nothing to contribute to the problem that he created (leaving it to Kotori to send a replacement), was unable to come up with a "fix" or bargain even though he took hours to get to the other venue, ran in already apologizing, and then took all the accolades?! I feel like he could have held himself better - and, if not that, then at least had faith in his idols. I can't believe that's too much to expect. The very end of the episode showed the debut of Ryuuguu Komachi with all the idols crowding around the TV to watch the recast (I assume it was cast once while live, since Iori couldn't "re-take" her verbal fumble). Everyone seemed pretty happy and excited, with the three of the group being very engrossed. 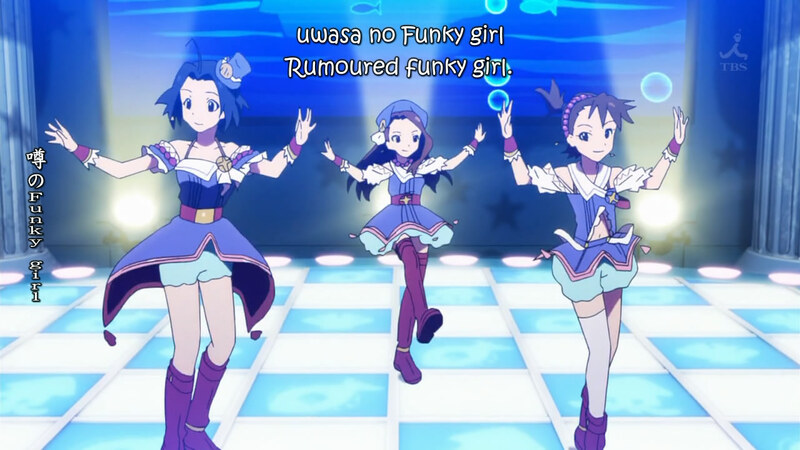 It's obvious that they're taking their job very seriously, with Iori singing along and Ami tapping her foot to the rhythm. Chihaya had her eyes open and her mouth agape, but was smiling at the end, so it's hard to assume that she felt resentment. The one most touched by the insert song was Miki, who truly seems to have "awoken". I look forward to really seeing her now. Do the twins' differences grow a little everyday? I had assumed that there might be some kind of problem between Ami and Mami, with the latter "left out", but there was nothing of that sort in this episode. While together, they were just as close as before. While Ami was gone, Mami didn't seem to be any kind of "depressed". Interestingly enough, the two seem to be kind of different, something I hadn't noticed before. 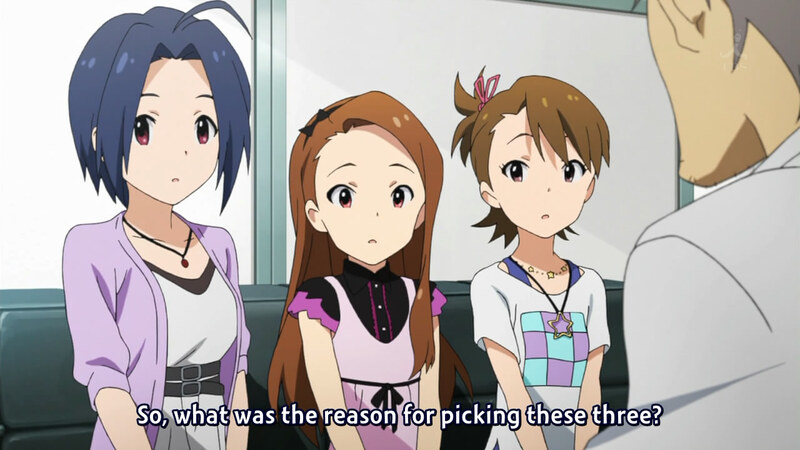 Mami's hair is longer than Ami's, so they don't seem to be pulling the "which one is which" trick that twins often do. 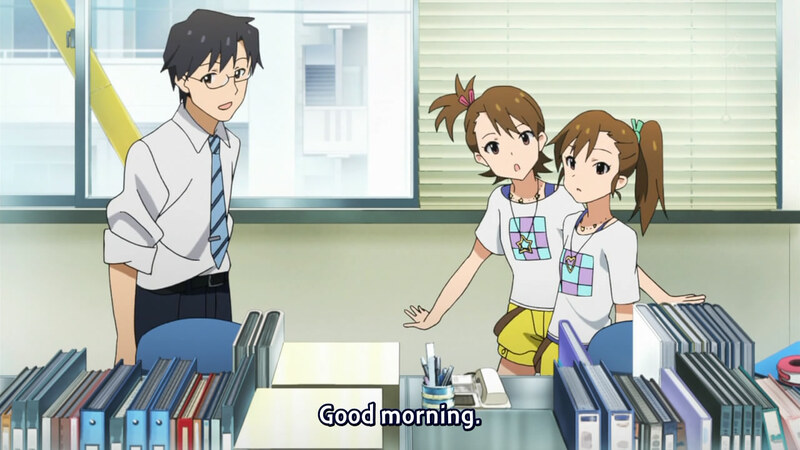 However, I question if they're really identical twins or not, because Ami seems to be taller than Mami. That doesn't happen with identical genes, does it? In another life, Kotori was a mangaka. This episode was kind of a surprise to me; I hadn't really thought that Producer would get a focus. I'm annoyed with the way he's been acting up until now and, while I'm not really convinced that he learned enough to change his ways for the better, I'm willing to give him a chance. I'm really hopeful that next week will go back to the "idol of the week" focus; I feel like there's too large of a crop of girls that I know almost nothing about.